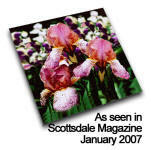 Welcome to a world of full-color, fully customized and personalized, one-of-a-kind ceramic and glass tile and murals. Whether you want to create a complete wall or floor mural, set a small mural into a wooden tray, or just display a favorite photo in the permanence of tile, we can help you create a unique work of art using your own designs. Choose custom tile when you want to make an outstanding statement about the quality of your business or home. Order with confidence - we will provide a sample tile for a $10 deposit, which includes shipping. This deposit is refundable when you place your complete order. Our tile murals come pre-numbered with an index sheet for installation. Replacement tiles and accent tiles are available. If you ever need a replacement tile, give us a call and we'll make it for you. Gloss - Suitable for decorative use. Will scratch if sufficient force is applied. Satin - Smooth surface but durable. Will scratch if extreme force is applied. Matte - Slightly textured surface. Will scratch if extreme force is applied. Glass - Use for cutting boards, bathrooms, kitchens, or floor tiles. Image is underneath the glass so it is scratch-proof. Our specialty is the attention we give to your image to make each tile look its best. Order your customized tile	today. 4.25", 6", 6"x8", and 8"
Beautiful murals from individual tiles. Choose standard 4.25" or 6" tiles. For unique floor tiles you now have a walkable tile option with glass tiles. Due to the size and complexity of murals, we generally will need to work from a photo or original art which we will scan and return unharmed, or a very high quality and high-resolution image you have scanned. The Simsbury Library's Grand Reopening was a huge success!! An important contributor to that day were the Designs on Demand trivets (for major donors) and mugs (for surprise gifts in library staff's mailboxes Monday morning). Everyone loved them! Thanks come from all the recipients, as well as from our Grand Reopening Committee. I'd like to add my personal thanks. You exceeded all expectations in terms of quality of your work, timeliness of your responses to our many emails and questions, delivery of the goods in a timely manner, and just being all-around nice people to deal with. Shipping/handling starts at $7.50 for one tile. FREE SHIPPING for orders over $50. Prices are for each tile. Similar tiles, such as with a text change only, can be grouped for the pricing breaks. Murals in glass tiles, add 25%. For such an investment and important purchase, we know you will want an assurance of image quality. 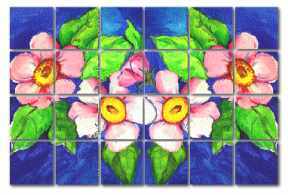 We will be glad to do a portion of your mural on one sample tile with a $10 deposit which includes shipping. The $10 will be credited to your account when you order the complete mural. Artists, galleries, and dealers: Ask about discounts on multiple sets of murals, as low as $40/sq. ft. Contact us by email at info@designsondemand.com to discuss your tile mural.